Stride (Released when both players' vanguards are grade 3 or greater! )-Stride Step-[Choose one or more cards with the sum of their grades being 3 or greater from your hand, and discard them] Stride this card on your (VC) from face down. [ACT](VC):[Choose a face down card named "Holy Dragon, Saint Blow Dragon" from your G zone, and turn it face up] This unit gets [Power]+3000 for each of your rear-guards until end of turn. If the number of face up cards in your G zone is two or more, and the number of rear-guards you have is two or more, this unit gets [Critical]+1 until end of turn. This ability cannot be used for the rest of that turn. 4th card of the week is Saint Blow Dragon. Digging how Bushiroad managed to lose some redundancy in his name when he was translated to English. But anyway. First you Stride, and then as your reward, you turn a copy of Saint Blow face-up in the G-Zone, and then he gains 3k for every RG you have on the field. And then, if you have 2 face-up G-Units in the G-Zone and you have at least 2 rear-guards, it's a Critical +1 for you. So basically unlike Victoplasma and Takemikazuchi, this card does something before you've Stridden a second thing. Not WELL, since lots of power in a time when the opponent's not inclined to guard anyway seems a waste, but at least it's at no penalty to setting up Altmile. 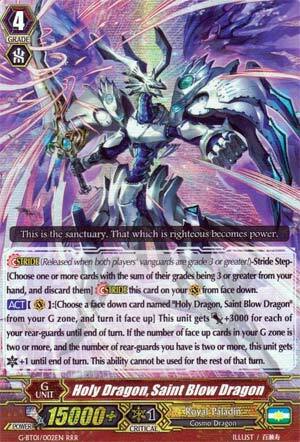 Saint Blow Dragon also functions as a follow-up to a Thing Saver Dragon that's run out of soul to spend, or just to soup up your Alfred Exiv for a turn. It is rather daunting to a player with little hand, a maximum of 41k (unboosted) with Critical. I would say that this was best in Seekers, since both Alfred Exiv and Thing Saver are excellent at whittling down hand with their skills, opening up room for this guy. Saint Blow is another one that needs to wait, and although he's not really an assured finisher, he's a pretty okay card to have. So, what we have here is the Royal Paladin PF Stride unit. I have to say, I'm not a big fan of this one. It's a great way to force pressure on your opponent, the sad fact is, this only works twice, since you have to flip a copy of itself face up to work. Another problem is that if you go against Kagero, Narukami, Link Joker or Gear Chronicle, this won't be as good, simply because of the field control those four clans have. For right now, it'll work, but I like what's coming in the next set better for Royals. At least it doesn't need counter blasts to use the effect, which is nice if you need to save them for some reason.